Hertzsprung-Russell Diagram showing the luminosity classes. A GV star, or yellow dwarf, is a main-sequence star. It is of spectral type G and luminosity class V on the Hertzsprung-Russell Diagram. The term yellow dwarf is a misnomer, because G-type stars actually range in color from white, for more luminous types like the Sun, to only very slightly yellow for the less massive and luminous G-type main-sequence stars. See spectral classification for a chart of star color by light type. GV stars are small (about 0.8 to 1.0 solar masses) and have a surface temperature of between 5,300 and 6,000 K. Like other main-sequence stars, a GV star turns hydrogen to helium in its core by means of nuclear fusion. 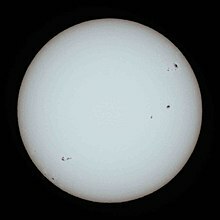 Our Sun is the most commonly known (and most easily seen) example of a GV star. Each second, it combines around 600 million tons of hydrogen to helium, changing about 4 million tons of matter to energy. Other GV stars include Alpha Centauri A, Tau Ceti, and 51 Pegasi. Our own Sun looks yellow through the Earth's atmosphere due to Rayleigh scattering. Without that, it would look white. Even though the name "dwarf" is used to compare yellow main sequence stars from giant stars, yellow dwarfs like the Sun are 90% brighter than all of the stars in the Milky Way (which are largely orange dwarfs, red dwarfs, and white dwarfs). A GV star fuses hydrogen nuclei together and release energy for around 10 billion years. After the hydrogen is used up, the star will grow to many times its earlier size and become a red giant like Aldebaran. Eventually the red giant will lose its outer layers of gas, which will become a planetary nebula, while the inside of the star (also known as the core) will cool and shrink into a small, very dense white dwarf. ↑ 3.0 3.1 Stellar Evolution: Main Sequence to Giant, class notes, Astronomy 101, Valparaiso University, accessed on line June 19, 2007. ↑ Why does the Sun shine?, lecture, Barbara Ryden, Astronomy 162, Ohio State University, accessed on line 19 June 2007. ↑ Sun, entry at ARICNS, accessed June 19, 2007. ↑ Alpha Centauri A, SIMBAD query result. Accessed on line December 4, 2007. ↑ Tau Ceti, SIMBAD query result. Accessed on line December 4, 2007. ↑ 51 Pegasi, SIMBAD query result. Accessed on line December 4, 2007. ↑ SIMBAD, entry for Aldebaran, accessed on line June 19, 2007. This page was last changed on 17 January 2016, at 16:21.